Westworld wasn’t the first TV show or movie to blend both Western and scifi elements—but it did it better than most. Still, while the genre has yielded some high-profile stinkers (Wild Wild West, Cowboys and Aliens), there are still plenty of amusing choices out there to help fill the long, long wait for Westworld’s return. Time-traveler Marty McFly had already wailed on the guitar in 1955 and hoverboarded in 2015—clearly the Old West was his next logical destination. Doc gets a love interest, Biff gets a gun, and there are train shenanigans galore. It may be the silliest Back to the Future movie, but all involved seem to know this, and are having a blast in spite of themselves. William Shatner’s directorial debut isn’t a typical Western. It’s not a typical movie, period. It’s weird as hell, and involves Kirk searching for and meeting God (sort of). But it also features scenes of Kirk, Spock, and Bones taking a dudely vacation in Yosemite. Photoshop in Jack Palance and a winsome calf, and this could be a still from City Slickers. 3) The Adventures of Brisco County Jr. In this Weird West TV show, Bruce Campbell plays a Harvard-educated bounty hunter who tangles with outlaws, rivals, and a mysterious object known as “the Orb.” Inspired in part by the Indiana Jones movies, Brisco County is campy and goofy and only ran for one season. All of those factors—plus, obviously, the presence of Bruce Campbell—contributed to the cult-favorite status it enjoys today. For everyone who ever watched a Western and thought, “What this story really needs is a bunch of rampaging dinosaurs.” The stop-motion effects are by the one and only Ray Harryhausen. Ray Harryhausen’s mentor, Willis O’Brien, came up with the story that inspired both this 1956 monster movie and Gwangi (which was released in 1969, seven years after O’Brien’s death). It’s about a Mexican town plagued by a rash of missing cattle, a phenomenon that has literally everything to do with the dining habits of a mysterious prehistoric creature lurking nearby. Though O’Brien didn’t end up doing the special effects on this one, Beast is still an early example of a stop-motion film made in color. As if you had forgotten. 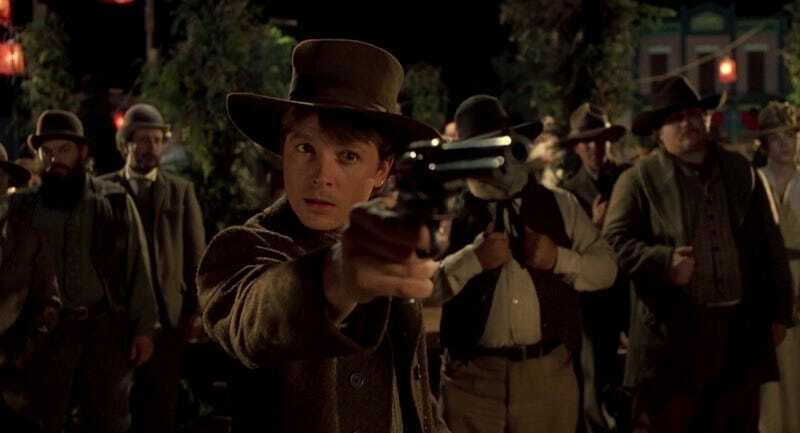 Joss Whedon’s beloved TV show and its follow-up feature focus on the travels of a spaceship and the adventures of its crew, but its Wild West homages are obvious (and a huge part of the fun of the show), and are embraced both thematically and literally. The twangy theme song is a dead giveaway from the start, even before the first episode arrives at the scene in which the show’s anti-hero heroes scout a potential ambush by horseback-riding outlaws on a deep-space pioneer planet. A bounty hunter (Richard Farnsworth), a cop (John Laughlin), and a foul-mouthed, dangerously ponytailed criminal (Michael Paré) clash on a prison planet. There are lots of dusty car chases and gun battles. As an added bonus, this jovial nugget of 1980s B-movie cheese has a punk soundtrack, for reasons that have since been lost to the galaxy. A dirt-bike daredevil (Fred “Remo Williams” Ward) travels back in time to 1877, where his bike becomes a highly sought-after prize among the local outlaws, and he becomes the ultimate fish out of water. The script was co-written by one of the Monkees, Michael Nesmith, and Peter Coyote plays the villain—the same year as his key-jangling performance in E.T. Legendary Western actor Jack Elam stars in this tale of an alien who touches down in a small Texas town. Originally made for a younger audience, this movie has transformed into something that only weird-cinema connoisseurs will truly enjoy. Mickey Hays, who played “the Aurora Spaceman,” was actually a teenager with the early-aging disease Progeria. America went to the moon in 1969, and so did Hammer Films, in this film about settlers venturing to our nearest intergalactic neighbor. (It’s actually set in the year 2021, and proudly bills itself as “the first moon Western.”) The bad guy is a filthy rich tycoon who’s scheming to get even richer by colonizing other planets in the solar system. Moon Zero Two got the Mystery Science Theater 3000 treatment a few years back, which is either an endorsement or warning, depending on your sense of humor. It’s a Western, it’s a musical, it’s a comedy, it’s an experimental art film, it’s a movie unlike anything you’ve ever seen (except maybe director Cory McAbee’s earlier feature, The American Astronaut). And if you didn’t already watch it ahead of the HBO show, now’s the perfect time to revisit the 1972 original film. It’s a lean, fast-paced, low-budget thriller that presents a remarkably grim world view—and its themes of corporate irresponsibility are still timely today.